The photograph below, contributed by Margaret Kenny, was taken at Turnberry during the war when the hotel was used as a hospital. Margaret's mother, Nurse Wilder, is standing at the right hand side of the front row. Margaret was wondering if anyone could help name the other nurses in the picture. Contact us at nurses@maybole.org if you can help with the names. Click on the image to view a larger photo. Back Row: from left: Mary Mcculloch, Maggie Dunnachie, Mary Goudie, ????????? ?, Jean Wilson, ???????? ?, ????????? ?, Nurse Fisher, Elsie McQuater. Middle Row: from left ???????? ?, ???????? ?, Bunty Kennedy, May Colquhan, Jean Brown, ???????? ?, ???????? ?, Nurse McQuater. Front Row: from left Nurse Jean McCallum (the sister of the late Minister at Straiton. 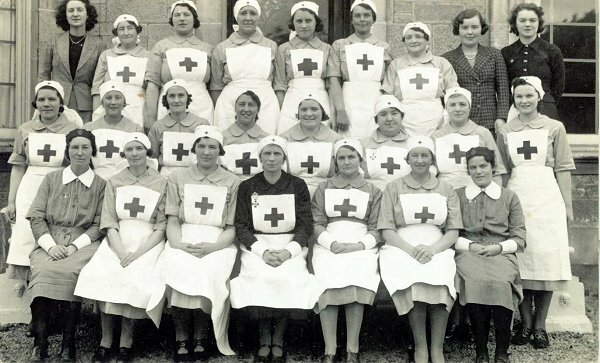 After the war she worked at Ballochmyle Hospital near Mauchline. Information provided by Herbert Kay), ???????? ?, ???????? ?, ???????? ?, ???????? ?, Meg Kidd, Rita Wilder (Margaret Kenny's mother).